For princesses and also princes. For sweet Dreams. Round-shaped with a frame out of bamboo. Diameter 27.56inch (70cm). Suitable for beds up to 78.74×62.99inch(200×160cm). Height of the curtains, approx 98.43inch (250cm). Height of the roof, approx 27.56inch (70cm). Material: 50% cotton, 50% polyester. The upper section (the decoration) and the pennant are made of pure cotton. The cotton content means the curtains feel very soft and the polyester content means they hang really well. Decorated with large buttons made from coconut shell and tassels made of cotton. Rondo70 hangs on one point and has four courtains, which overlap in the middle by about 7.87inch (20cm). The delivery contains the bamboo frame which fixes the form and four chords for the curtains. 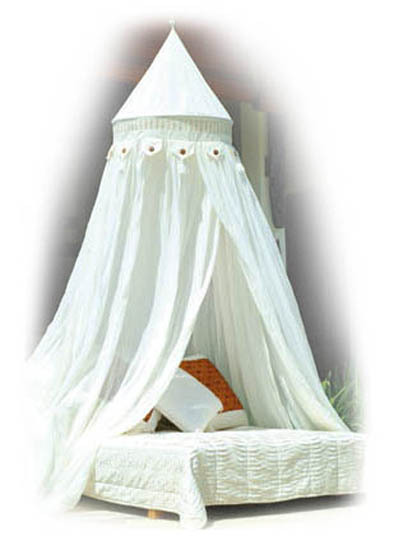 This canopy is a year-round accessory, whether for romantics, for cuddling or just for feeling good. For kids it’s a super cave or princess’s canopy. Our children are always really disappointed when their canopy has to go into the wash.